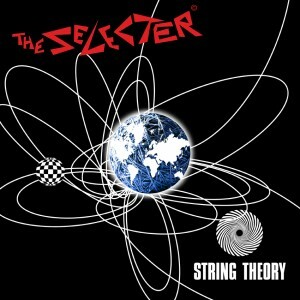 Teflon aka John Sims is pleased to have designed the sleeve and graphics for the forthcoming new album by The Selecter titled “String Theory”. So how did the album design evolve and what is is String Theory? We live in a wonderfully complex universe, and we are curious about it by nature. Time and again we have wondered— why are we here? String theory is an active research framework in particle physics that attempts to reconcile quantum mechanics and general relativity. It is a contender for a theory of everything, a self-contained mathematical model that describes all fundamental forces and forms of matter. String theory posits that the elementary particles (i.e., electrons and quarks) within an atom are not 0-dimensional objects, but rather 1-dimensional oscillating lines (”strings”). It is also the wonderful new album of new tracks by The Selecter that will have its fan base skankin’ everytime it is heard and played. The design was produced in Adobe Photoshop, Adobe Illustrator and QuarkXpress… and a little electron magic by Teflon. You are currently browsing the classic 2-tone graphics news archives for December, 2012.